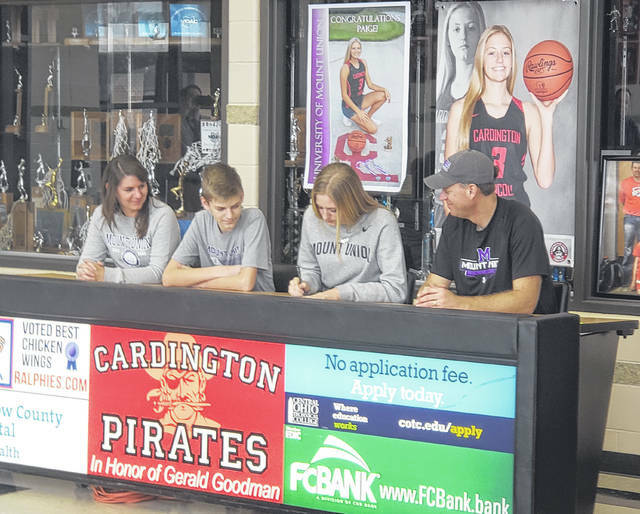 Cardington’s Paige Clinger signed Wednesday to play basketball at the University of Mount Union. Pictured above are (l-r), mother Molly, brother Ryan, Clinger and father Matt. After finishing her senior year at Cardington High School, Paige Clinger will continue playing one of her three sports — basketball — at the University of Mount Union. For the Pirate senior, it was a more difficult decision to pick what sport she’d play in college. Through her four years at Cardington, she’s been on the volleyball, basketball and softball squads and is on pace to wind up with a total of 11 varsity letters. At Mount Union, she’ll major in early childhood education. She noted that the school’s coaching staff felt her skills would complement the team’s roster. As someone who prides herself on being a team player, Clinger is excited to spend time with her new team and find out what her role will be. When Clinger goes to Mount Union, she will take a lot of fond memories of her years in Cardington with her.